The pow wow is an activity unlike anything in the culture of non­-natives. 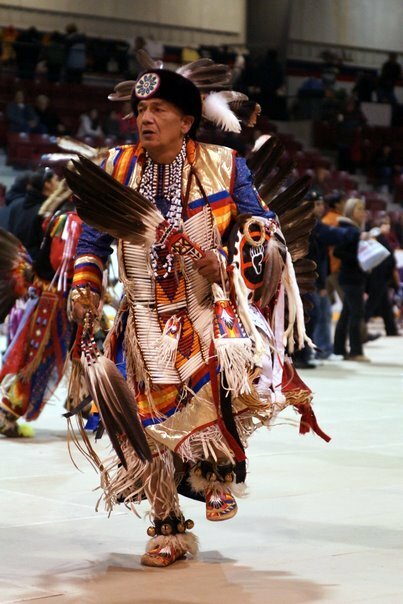 The pow wow is a spiritual gathering of nations, while at the same time it serves to distinguish between the social and cultural differences that set natives apart from other societies. Indeed, the pow wow is the expression of a way of life for native communities across Canada and the United States. And while the pow wow is colour in motion to most non-natives, to North American Indians the pow wow serves a far greater purpose. Despite the ever-changing face of the nation on both the social and political fronts, pow wow tradition is one constant that remains throughout First Nations communities. As well, the pow wow serves to bond tribes and bands of different linguistic geographical locations, building a bridge between it's paricipants. All Indians, whether they are of Ojibway, Iroquois or Sioux descent, are welcomed to take part in the intertribal festivities. From early spring to late fall, year after year, natives from across North America travel great distances to gather and to celebrate their heritage through singing and dancing. It is the expression of harmony among First nations and a way of life that has not been forgotten. The history of the pow wow is a long one. One must go back to the arrival of French explorer Jacques Cartier, in 1534, to the "new world" for the first recorded account of native dancing. carter recorded that up0n his arrival at the mouth of the St Laurence river, he was greeted by seven canoes filled with Indian warriors dancing while the women, knee deep in water, danced along the shoreline. Cartier also noticed that he had landed among the Algonquin Indians. Further up the river, he was again greeted in a likewise manner, upom his arrival in the Iroquois village of Hochelaga. It was observed and recorded by Cartier that dancing was universal to the native communities, as well as vital to their ceremonial practises. The term pow wow is a European term that has since been borrowed back by natives. "Pau wau", which means medicine man or conjuror, was misconstrued by European settlers who witnessed the healing practises of the village shaman as he was also known as. The frequent use of the word was taken to mean "the gathering of natives" that surrounded the medicine man during healing practices, rather than the man himself. Since the Nineteenth century, "pow wow" has largely been associated with any meeting, religious or social event involving natives. The pow wow therefore, can be said to be a gathering of First Nations. The historical origins of the pow wow point to the Plains Indians of The United States. 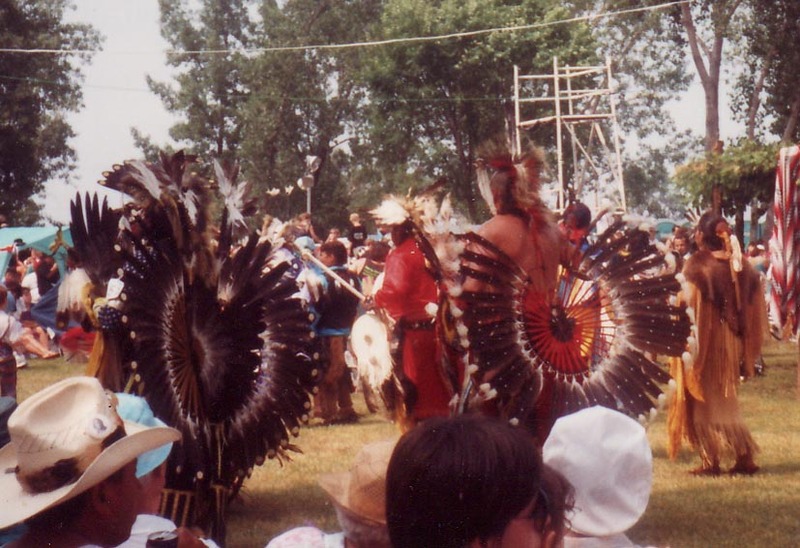 Other accounts state that the Algonquin Indians of New England played a significant role in the development of the modern day pow wow as it is commonly regarded. Probably the most significant renderings of native life in the early days of European exploration can be realised through the artistic works of George Catlin. Catlin spent eight years amongst the Sioux Indians of the Plains in the early 1830's, painting and writing about their way of life. He is regarded as the best known of the American artists who depicted Indian life. His writings are also valuable sources of information. Natives lived an oral tradition and taught the ceremonies and dances to future generations by word of mouth. Therefore, the writings and paintings of settlers, in particular George Catlin, are primary sources for historical analysis, as far as the early pow wow traditions are concerned. European settlers, the pow wow continues to bring First Nations together; harmoniously and with great pride and dignity. If you don't see a menu hit the above link to reload this site.